So, a few weeks ago I was editing my photos when all of a sudden my computer starts making an awful screeching noise. If I didn't know any better, I would have thought a pterodactyl was about to come crashing into my living room. My screen locked up, I did a reboot on my computer, then... nothing. After a lot of attempts at fixing it, and a lot more cussing, I did eventually get it to run again, but needless to say, that was the beginning of the end of my old laptop. Jason bought me a new computer and we have been very slowly getting everything transferred over. I am one who hates change, so getting used to a whole new computer has been frustrating to say the least. I found out Microsoft stopped supporting my old email platform 3 months ago, so the email I've used for 15 years is no more, and now I have to adjust to a new email setup. When it rains it pours, people. It does feel like life has thrown a lot of lemons my way this month, so I decided to take the high road and turn those lemons into a tasty treat. 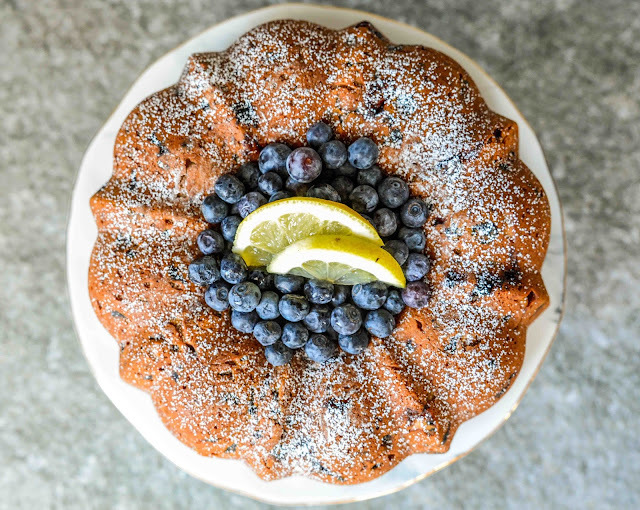 I found this Lemon Blueberry Cake on Golden Blossom Honey last week and knew that it would be the ticket to adding a little ray of sweet sunshine to my rainy days. I sprinkled a little powdered sugar over the top, but you could also add a good lemon glaze over it as well. You could even substitute the dried blueberries for dried cranberries or cherries if that's more of your flavor preference. This cake would be perfect for Easter brunch, or to serve on a warm spring day while enjoying a cup of tea with friends. 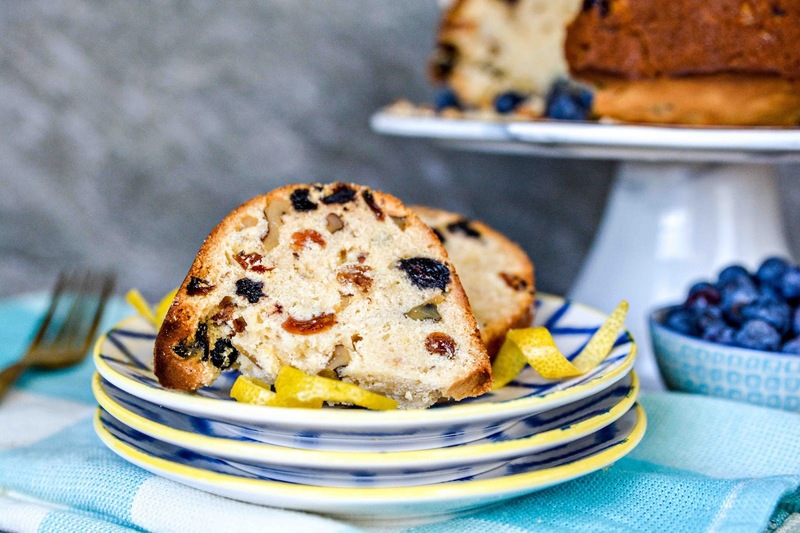 What are your favorite fruits to add to springtime cakes? I cannot imagine anything more frustrating than being without a computer or internet, it just gives me creeps and sometimes I cannot sleep at night just thinking of it all scared! WHy did not you put your new one next to the cake so that we can see it! This cake screams DEZZY! You know I love me nothing better than lemon and blueberries! My fave fruits with banana! Looks so gorgeous, you must make it once for me! Isn't it crazy how we rely so much on being online? 20 years ago I would have rolled my eyes. Now we freak out if we don't have access to it for more than a few hours. First world problems, I know. I'm still not in love with my new laptop. It is much nicer and much faster than the last one, but I have such a hard time with letting go of things I use frequently and am familiar with. As soon as I do some tweaking to the settings, I'm sure it will be grand then. Today is quite warm here, which is lovely. I have the doors open to get a fresh breeze through the house. Our tulips aren't popping up yet, but I did notice my irises have started poking through. Our February forced little buds on my branches, then it went back to frigid temps, so I hope that doesn't stunt spring growth here. The weather sure is odd all over the world. A sign of global warming, you think? First tulips have opened today here, hyacinths last week, violets, daffodils too, forsythia as well and this morning even two of the first irises, with this rate I'm worried we won't have any flowers left to bloom in May or June or July when summer really comes! I dont' bake anything so...none? Do you ever get fruit in your pastries or donuts when you and Daisy are out and about? Oh my goodness how amazing does this sound, I have to admit I do love lemon in a good cake, it adds just a lovely sharp taste yum. It sure does! I used to hate the flavor of anything lemon, but finally wised up in my older years and enjoy it frequently these days. This cake looks so yummy. This time of year I like to add fresh Strawberries. 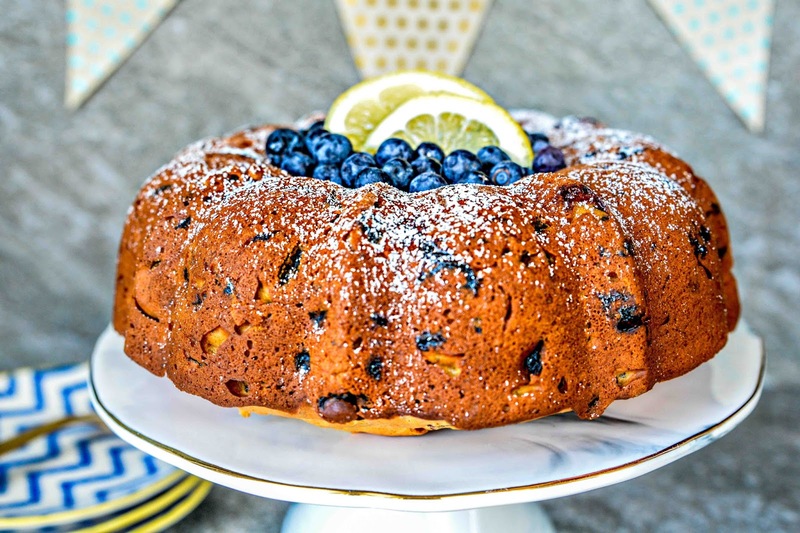 Lemons and a blueberries are a classic flavor combination, and one of my favorites. This looks so tasty! That looks so amazing! I love all the blueberries nestled in the center of that cake, and I love that you used honey to add a healthy sweetness. Lemon and blueberry is the best combination in baked goods. I want that cake in my belly immediately! Lemon and blueberry do go really well together. Your cake looks terrific, and I love how much fruit there is in the middle. Blueberries can be a win indeed. Are you stuck with crummy windows 10? Blah to that. Hate getting used to a new system too, but what one must do. Don't you just hate updates you don't need? Ah, adjusting to all of those new things must be frustrating. Lemon blueberry cake was a great choice! I add June Berries. It's poor man blue berries. Our bush though...it took a hit a few years ago with too much rain, or something. Now it doesn't look well. It may have to come out. This looks so yummy. I love blueberries in all sorts of pastries. I am sure I would enjoy this cake. What a beautiful cake! 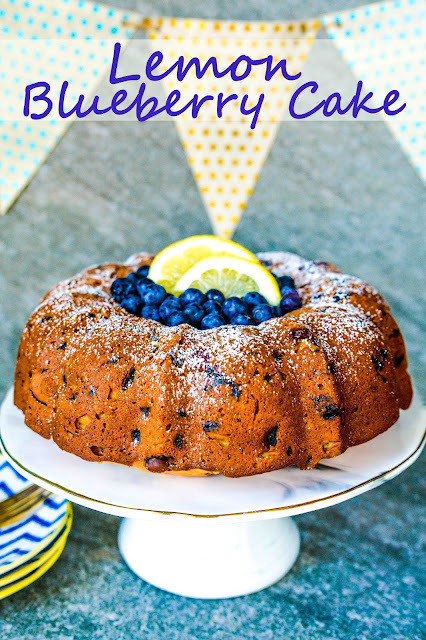 I'm not a huge fan of lemon or blueberries but my husband loves both of them with a passion so many of my desserts end up this flavor. the amazing aroma of lemons and blueberries was wonderful. Then when you take a bite, you realize that these two ingredients do such a great job complimenting each other. Your cake is amazing. I love lemon anything so this is a winner in my book. I am not really good at baking but I want this cake so much I am thinking of calling my sister to come over and make this cake for me. I may have lost eight pounds being on a diet and all, but that doesn't mean I wouldn't want to try out this gorgeous-looking cake. Did I mention the blueberries are an excellent choice? Blueberries and lemon together? Sounds like the perfect combination or sweet and sour. I'd like a slice! Almost looks too pretty to eat. Wish you the best with the new computer. Oh - that looks so good. That would make a great dessert for any spring/summer event. I love fruit in just about any type of dessert, but my favorite to add to dessert will always be cherry - as in the cherry pie filling...the really gooey, bad kind. LOL! Although if we're talking fresh fruit, it would have to be strawberries. And I have to agree with mail4rosey - cranberry and orange would be really good in this as well. Yummmm! Actually I have to take that back...fresh peaches in a cobbler would have to be my favorite, after cherries. My computer crashed with all my tax stuff on it - UGH- it's the worst. Your cake looks amazing- eat cake-be merry! That looks almost as delicious as it is pretty.